The following page contains keys to improving the basic skills in volleyball such as spiking, setting, passing, blocking, and serving. Train the end of the hit. 1. Get your arm vertical. When you contact the ball, your arm should be straight up and down from wrist to shoulder. 2. Elbow to wrist action. Get your players to use a whipping action on the ball. You want to contact the ball reaching high with your arm vertical. Contact the ball in a way that makes the ball spin down into the court. Your approach is useless if you're not going to contact the ball right. Another key to approaching is trying to always stay parallel to net as much as you can. Also, keep the ball in front of you. If the ball passes you, and you don't stay parallel to net, you lost about 60% of your range. Success is all about knowing what good positioning is. The better you can stay parallel and keep the ball in front of you, the easier it will be to get in good position. If you aren't blocking the ball with one hand, youre probably not a very good blocker. Many players make the mistake of always trying to make contact with the ball with 2 hands. 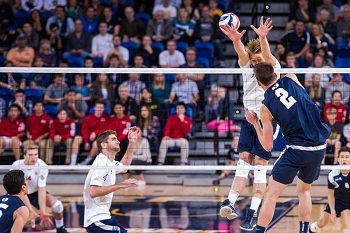 Most blocks occur with only 1 hand on the ball. Also, penetrate the net every single time.The best blockers block the ball on the other side of the net. And block the ball with your hands, not your arms. Especially when the ball is tight to the net, you want to make contact with the ball immediately after your opponent does. If you're tall and can reach far over the net, you shouldn't have many tight balls get around you. Time and time again I see tall blockers get frustrated when small hitters get the ball by them. This often happens because the blocker forgets to get their hands on the ball. Especially if the ball is tight, focus on penetrating the net and surrounding the ball with your hands. The key is "knowing your opponent". You got to think like your opponent. You've got to know what they like to hit. 1. Block the ball where it's going to cross the net. 2. Penetrate the net and take up as much space as possible. Obviously, if the ball is tight and you can get your hands around it, then that's the best option. Serve with purpose every single time. Dont ever just serve to get the ball in. Every time you serve, you should be trying to do something with it. Its easy to become a lazy server. Its often hard to focus on serving because poor serving isnt necessarily so obvious. For example, if you just get the ball in, you can still win the rally. Or even if you dont win it, its not so obvious how easy your serve was to pass. If you want to be an effective server, you've got to have confidence. When you go out there, you need to think you're one the best servers ever. You need to have extremely high standards. If they pass it ok, be upset. Also, you'll actually miss fewer serves if you focus on placing the ball instead of just trying to serve the ball in. 1. Get your feet to the ball. Again, positioning is key. Get your feet there to help you get in position. 2. Know your primary hitter. You should set your primary hitter most of the time. Knowing who to set is extremely important. You also have to know who's hot. Don't make the mistake of mixing it up for sake of mixing it up. This is a very common mistake that setters make. 3. Set with purpose. Again, don't mix it up to try and fool people. Have an offensive strategy. It's much easier to set if you have a plan of attack. 4. Dump the ball more. Most setters don't dump enough. It's important to make defenders respect the short game. This will make it much easier for hitters. Again, don't worry about keeping players happy. The coach is the only one that needs to be happy. As far as defense and digging goes, most players need to work on their front to back game. Learn to go forward and layout with arm out and dig the ball. Also, learn to forward sprawl. This is the floor move that really needs to be learned. (not the pancake and not the side sprawl). This is an important movement in the front to back game. Also, work on front to back defense. Another key to playing effective defense is studying your opponent and practicing anticipating how they attack the ball. It's important to expect to move first, then dig second. The better you are at predicting where the ball is going, the easier it is to get in position to make the play. 1. Be confident. When it comes to passing, confidence is rarely talked about. You need to become a confident passer. 2. Think you can do it. You've got to think you can do this. Don't beat youself up because of mistakes. 3. Believe you're going to get it - this is the most important thing. If you ever watch the best passers, you may notice that most of them are moving the direction the ball is traveling and away from the target before they get in position to pass. For example, most great passers aren't moving at the ball (it's more like moving with the ball, stepping backwards). I believe this is the easiest way to pass. Start closer to the middle of the court and be sure to move towards the sideline or endline when you pass because its easier to pass when youre moving with the ball and away from the target.